At eVacuumStore we carry models of Dust Care central vacuums perfect for homes ranging from 5,500 to 10,000 square feet of space. When it comes to heavy duty, durable machines within an affordable budget the Dust Care name cannot be beat. These versatile units are great for commercial vacuum cleaner purposes, as well as residential use. On our site we carry the Dust Care DCC-2000C and 3000C in addition to the Dust Care DCC-4P and 6P. For homes up to 6,000 square feet, the DCC-6P is a great choice. Providing 465 air watts of power at 95 CFM (cubic feet per minute), this machine has what it takes to clean beyond expectations. For slightly larger domestic settings, the DCC-4P is highly recommended. Possessing the ability to take care of up to 9,000 square feet with its 120 volts of power makes this central vacuum system one of the best in its class. The DCC-2000C and 3000C are powerful machines intended for larger homes and even commercial settings from 9,000 to 10,000 square feet. The 2000C is capable of handling up to 9,000 square feet at a suction power of 645 air watts with an incredible 86 CFM and dual-motor system. 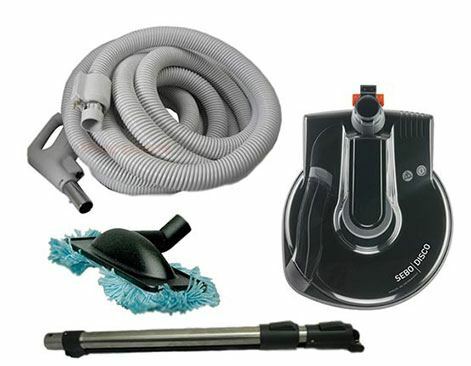 However, the most powerful Dust Care vacuum used for central vacuum purposes is the DCC-3000P. Boasting 655 air watts of power and the ability to clean up to 10,000 square feet, this machine is ideal for larger residential spaces and in some cases even commercial areas. On our site customers will also find the DCC-8 Dust Care central vacuum which is meant for living areas up to 5,500 square feet. This model of Dust Care machine uses HEPA filtration to help increase the air quality in your home and includes a four gallon container for housing all debris, dirt and particles picked up during the cleaning process. Although it covers the least amount of space of the Dust Care central systems, the HEPA vacuum cleaner filters and performance measurements in addition to how affordable it is, makes this machine a force to be reckoned with. For any further Dust Care central vacuum related assistance, call eVacuumStore today at 866-972-8227.